Great location, lots of facilities and restaurants nearby. The location was perfect and extremely easy to find from Roma Termini. Communication was excellent with the office staff and our "key holder" (Marlin?) was extremely accomodating, flexible and punctual. We did have our adult son stay with us for two of our three nights. The sofa bed was comfortable but made the living space a bit tight for three adults. The apartment was very well equipped and a comfy living space for a couple though. The apartment is located in an amazing area with plenty of sights and restaurants nearby. Close walk to other major sights. A bit of a walk from Rome Termini so check the distance before walking. Hosts are very friendly and accomodating. A localização é muito boa perto de tudo, supermercado,farmácia,restaurante,acesso fàcil a todas as atrações da cidade ,estacão de metrô, praticamente ao lado. La zona è molto piacevole. Si possono raggiungere a piedi tanti luoghi di interesse. La posizione è assolutamente perfetta, la zona tranquillissima. Nos fue bárbaro! El departamento es cómodo y dispone de todo lo necesario.. esta muy cuidado.. Y su ubicación es excelente.. Para recomendar! Muchas gracias! La ubicación es lo mejor que tiene el apartamento. La calle tiene bares de copas y puede ser ruidosa, hay alguna cafetería para desayunar y está perpendicular a una calle con mucha vida, Cavour, y muy muy cerca del Coliseo. Aún así no volveré ni lo recomendaré. 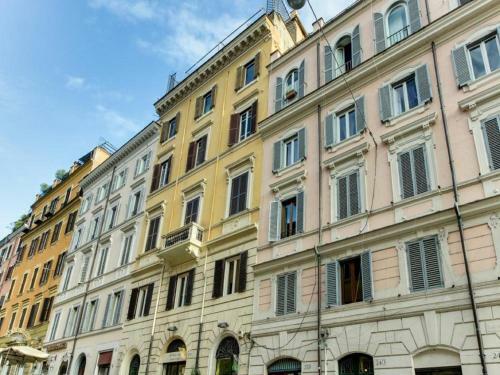 Located in Rome, a 13-minute walk from Quirinale Palace and 0.7 miles from Roman Forum, Monti Cozy Apartment S&AR offers free WiFi and air conditioning. The property is a 15-minute walk from Santa Maria Maggiore. The apartment features a flat-screen TV, a well-equipped kitchenette with an oven and a microwave, and a bathroom with a bidet and free toiletries. Piazza Venezia is 0.9 miles from Monti Cozy Apartment S&AR, while Palatine Hill is 1.2 miles from the property. Ciampino Airport is 10 miles away. When would you like to stay at Monti Cozy Apartment S&AR? This apartment has a stovetop, dishwasher and tile/marble floor. Browse our ample selection of holiday lettings in Rome and start planning the trip of a lifetime today! With a wide range of properties suited to solo or business travellers, family holidays or a romantic getaway for two, you’re sure to find the accommodation you need. Our Rome apartments range from comfortable studios that prioritise practicality to luxury flats designed with indulgence in mind, meaning there’s something to suit all tastes and budgets. What’s more, when you book with Suites & Apartments Roma, you can rest assured that we’ll bring you the best prices and the best service! Thanks to our experience and professionalism Suites & Apartments Roma provides an exclusive service of Self Catering accommodation in Rome: suites or apartments with kitchen, located in the most strategic areas, in the heart of Rome. They say all roads lead to Rome, and we believe that everyone should visit the Eternal City at least once in a lifetime. With an unrivalled wealth of artistic treasures, an inspiring cultural scene, a rich history, some of the world’s most instantly-recognisable monuments, irresistible cuisine, astounding architecture and endless festivals, Rome really is the city that has it all. House Rules Monti Cozy Apartment S&AR takes special requests – add in the next step! A surcharge of EUR 20 applies for arrivals from 22:00 until 00:00. Check-ins after 00:00 comes at an additional cost of EUR 50. All requests for late arrival are subject to confirmation by the property. Please inform Monti Cozy Apartment S&AR of your expected arrival time in advance. You can use the Special Requests box when booking, or contact the property directly using the contact details in your confirmation. The shower didn’t work- only the hand held one. Very very high cleaning price and then still expected to sort all the rubbish and recycling. The advertisement not accurate - there is no air-conditioning. This caused some issues with our check-in. The hosts happily accommodated us in other ways, but as it is listed in the advertisement it is misleading. The bedroom is very small - there is barely enough room to get around the bed. The bathroom is very cramped and the drain was clogged and pooled with water. The wifi has trouble reaching throughout the apartment (particularly in the bedroom). We found the apartment very noisy with the windows open. Closing them did improve this greatly. The apartment is very close to restaurants and bars (which is great) but that brings the noise. I was concerned that the shower base was going to overflow because it drained extremely slowly.